We've taken historic craftsmanship into the modern era by adding a highly polished finish. Designed to match all of the items in our Forged Collection for a perfectly matched ensemble, but also very eye-catching when worn alone. 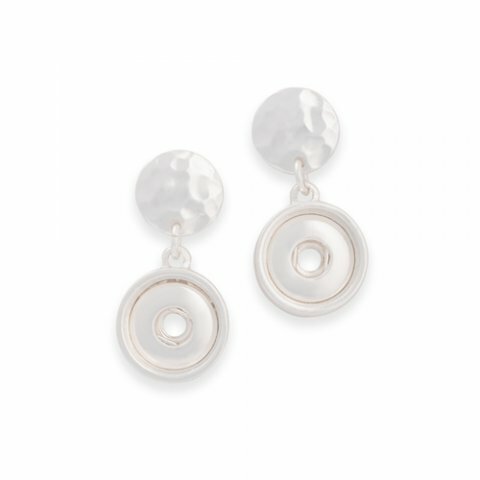 Not only does your Dot of choice shine in these earrings, you have an added bonus of the hammered discs on your earlobes. This pair will make you want to wear your hair up so you can show them off! If your looking for a lightweight earring that is trendy - you will love these! These earrings are very comfortable to wear and I never have to worry about them falling off of my ears as the post is the perfect size. I always receive a lot of compliments every time I wear them. The pictures do not do these earrings justice. I love my Couture Dots in these for that extra bling. So pretty and lightweight. I can't get enough of the Forged Earrings! The hammered look just adds to their beautuful design. They are very comfortable to wear. Not heavy at all. Lightweight and comfortable to wear. Easy to dress up or down. Love the hammered silver. These are great earrings!